Sorry to say, I haven't been very good at staying in touch. Life and it's challenges have a way of setting other priorities. I stay in contact with Julie Fender. Tina Hoots Young posted a message. Hi Liz. I hope your enjoying the summer. When you get a minute, would you send me details regarding the memorial for David in November? Are you going? Tina Hoots Young added a comment on her Profile. Tina Hoots Young posted a message. New comment added. Hi Angela. My son is in the USAF as well. He joined in January 2014 and is stationed in SC for now. Tina Hoots Young updated her profile. View. 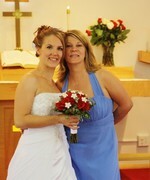 My niece and I at her wedding, May 8,2010. I'm on the bottom step, holding my niece. My son is wrapped up in the light blue towel. My son Logan, 14 at the time, is on the left. His team won the regional soccer tournament that year. Christmas 2008 at our house in Maple Valley. Christmas 2008 with our crazy Basenj/JRT dogs.